Mash the potatoes in a bowl. Add red chilli powder, cumin powder, turmeric powder, coriander powder, chaat masala, coriander leaves, salt and breadcrumbs and mix well. Divide the mixture into 4 equal portions and shape them into patties. Lightly flatten and roll on a flat surface to get even edges. Put it in a zip lock bag and freeze overnight. Heat sufficient oil in a kadai. Deep fry frozen potato tikkis till golden brown and crisp. Drain on an absorbent paper. Take mayonnaise and green chutney in a bowl and mix well. Cut the burger buns horizontally into halves. Spread a tablespoon of mayo-chutney mixture on bottom half of each burger buns. 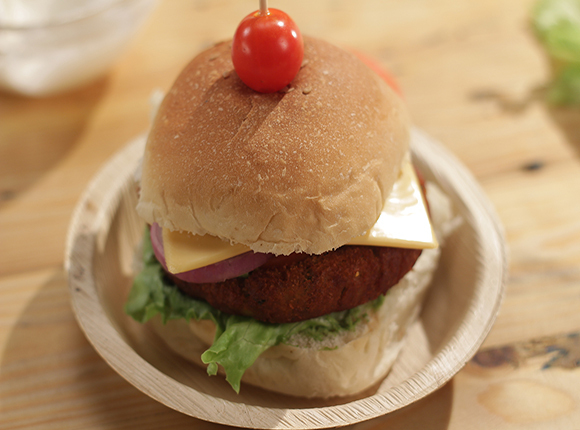 Place a few lettuce leaves then the tikki, 1-2 tomato slices, 1-2 onion rings and a spoonful of the mayo-chutney mixture. Place a cheese slice and cover with the top half of the buns. Skewer a cherry tomato on a toothpick and secure the burger with it. Serve immediately.